Kenyan Athlete: Kenyan road races that were not in the interest of athletes have quickly disappeared! Kenyan road races that were not in the interest of athletes have quickly disappeared! 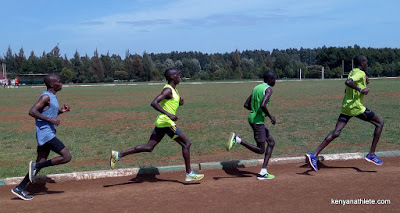 In the recent past, when a road race was announced around the big training destinations in Kenya, it had always been great news to the athletes because they saw it as a rare opportunity for them to test their strength against other athletes training in various other camps, and an opportunity to perfect race strategies and get more experiences on how best to run in future competitions. Athletes were definitely not going to be left out of any race despite short notices they usually got, meager prize money being offered and even the lack of water and aid stations on the route. They would immediately adjust their training program in readiness for these races and turn up in large numbers at the starting point on race day. It had reached a point where volunteers would even get paid four times the amount that the poor athletes would get in prize money! I remember, in 2013, with one day to a certain race we were preparing to run in Eldoret, I and my training group had gotten curious to know the winning prize. Our coach had made a phone call to one of the organizers of the race. We were shocked to learn that, apart from the registration money being higher than it has always been for other races around, the winner was to walk away with only Ksh. 5000 (about $57)! We had to ask again about the sponsors of the race and we became even more puzzled when we learned that a number of big companies, not only Kenyan companies, but trans-African ones and a number of commercial Banks around the region were participating as sponsors of the event. We sensed that all was not right with the organization. It was not so much about the meager prize money that made us to pull out of this race, but the perceived image these organizers had of athletes willing to compromise their training schedules and turn up in large numbers to compete in a race like that. I and my group decided that we were not going to participate in this race and resumed our normal training. But, curious to find out the nature of the organization of this race, and to find out for myself whether what we heard over the phone was not a prank, I set out to the venue to watch the race after my morning run. It was only after the security officials manning the entrance to the pavilion advised me not to enter if I was interested in watching the race did it began to dawn on me that the 10km race could have been just but a side show for another main event that was to take place in the pavilion. Many questions crossed my mind as to how all these could be related with the race. I hoped that I was going to get answers as the day progressed. Most of the people around the place seemed to have been caught unawares as athletes who had begun their road race some 10km from the venue entered through the main gate and everyone was being asked to give way. Very few athletes in the first positions were able to get some water at the finish line. The rest were very unlucky as they were dismissed, sweaty and thirsty. The top six athletes were taken aside and promised that their prize money was going to be handed out to them the following day. The finishing line of this race was outside the entrance to the pavilion and most of the people who had turned up for the main event of the day even failed to notice that there were runners running a race! There were no press people to interview the athletes. I talked with the two winners and it was quite a relief to hear that Mathew Koech who won the men’s race was happy for a great comeback after it had been a while since he last won a race. Irene Chelagat told me it was her first road race ever and she liked the experience. For now, that race and many others of that nature have suddenly disappeared thanks to the law of supply and demand as many races like the Eldoret City Marathon, the Ziwa Farmers Marathon, the Kaptagat Forest half marathon, the Iten Marathon and many others have sprung up and athletes now have great options if they are planning on running a local race. Athletics Kenya (AK) has also moved in to set the minimum requirements in the organization of races in the country and on the amount of prize money to be paid to runners. 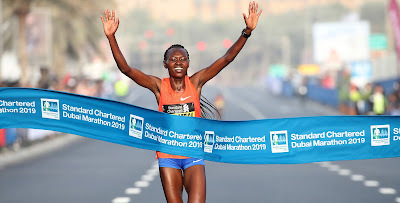 With this trend in the emergence of new road races in the country that care about the sport and the welfare of runners, the future of road running in Kenya looks bright. Many people, regardless of their ages, given that many races are adding prizes for age categories, are going to get fitter.